The Guardian website is the UK's most widely read daily newspaper site each month, with almost 8.2 million visitors, according to the latest figures released by the National Readership Survey (NRS) in its print and digital data (PADD) report. The Daily Mail, which held the top spot for both website only and combined - print and online - readership in the last PADD report from the NRS, slipped to second place in terms of unique monthly visitors with 7.6 million, but maintained its position as the most widely read newspaper in terms of combined readership at 18.8 million readers a month. 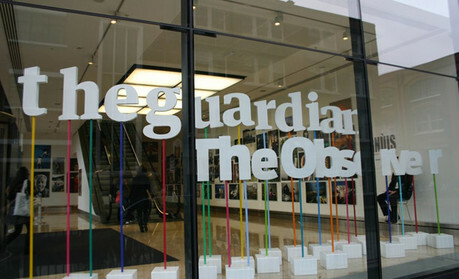 "Digitally, we're in the strongest position we've ever been in," said David Pemsel, Guardian News & Media's chief commercial officer, referring to the Guardian's plans to move their global domain name to guardian.com and other digital projects in a statement, "with record global ABC traffic and the UK's number one quality newspaper mobile site." "All of this demonstrates that we are truly a media brand to be reckoned with, not only in the UK but around the world," he said. The figures, the first PADD report for 2013, combine NRS data from April 2012 to March 2013 with comScore statistics for March this year. The results show that the Guardian had the widest reach of the UK's "quality" newspaper brands in terms of monthly (12.5 million), weekly (5 million) and daily (2.3 million) combined readership, followed by the Telegraph (10.7 million, 4.7 million, 2.1 million). The Guardian's combined readership also represented the largest proportion of online to digital, with a 192 per cent increase provided to the total by the online readers. Overall, the Daily Mail still had the largest combined monthly readership across the board with 18.8 million print and online readers, followed by the Sun with just under 17 million and the Guardian in third. In terms of weekly and daily readers, the Sun remained the most popular newspaper with 12.6 million and 7.2 million combined readers respectively. Elsewhere, The Daily Express experienced a significant rise in its online traffic when compared to the last PADD report for 2012, increasing more than twofold from 518,000 to 1.3 million, and the Financial Times' online readership reached just over one million, despite the paywall. The only other national newspapers to see an increase in combined readership were the Independent and the Sun, with every other news outlet experiencing a decrease. This is the second time the NRS has combined comScore data with its own statistics, having previously used UKOM/Nielsen for online figures. The readership numbers are revised to remove duplication, where readers are understood to read both print and online.